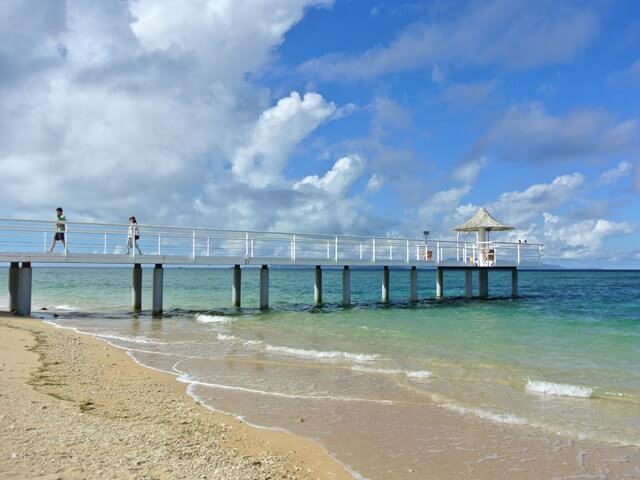 The beautiful emerald green water around the islands of Okinawa is a must-see. 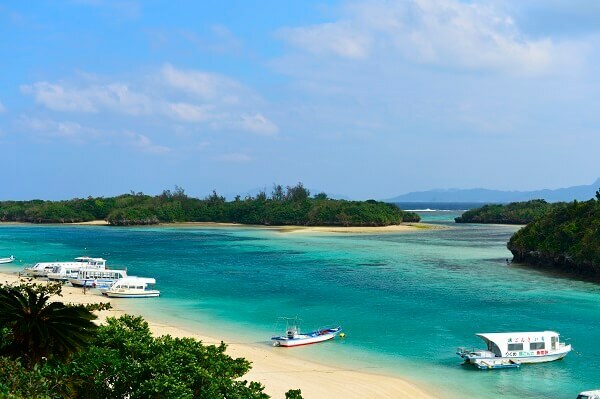 Among the islands of Okinawa, Ishigaki Island is one of the best. 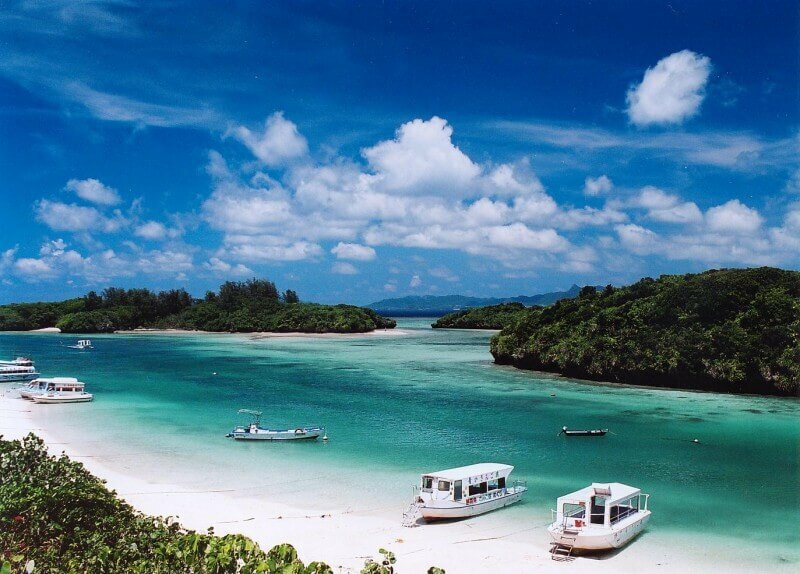 In particular, Kabira Bay on Ishigaki Island is a must-see spot. The many attractions of the scenic Kabira Bay will be introduced here. ※The information presented here are current as of 2015. 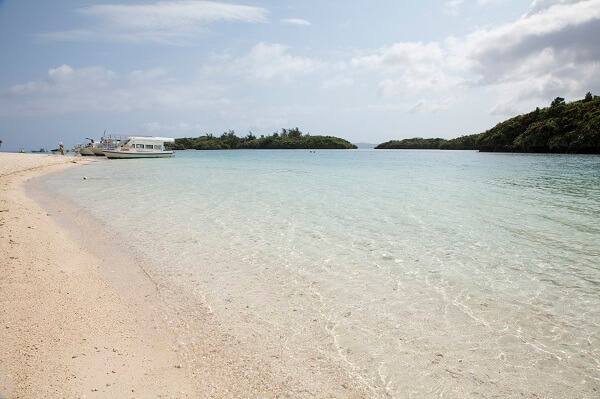 Ishigaki Island, where kabira bay（Kabira bay／KABIRA-WAN）is located, is one of the larger islands of Okinawa. Kabira Bay is located on the northwest side of the island. 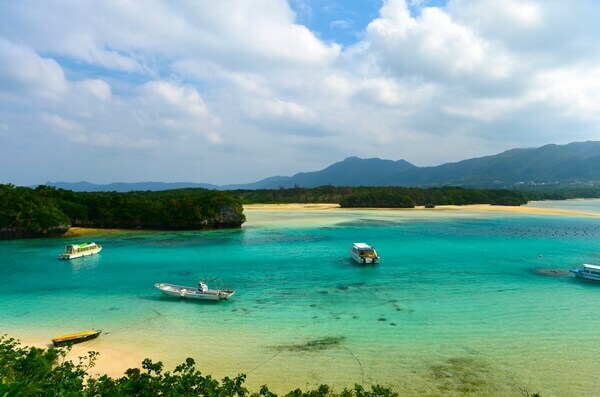 Selected as one of the 100 Landscapes of Japan, it is a famous spot that is commonly associated with Okinawa. 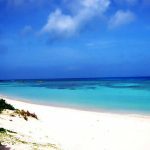 It is always featured in guidebooks for Ishigaki Island. 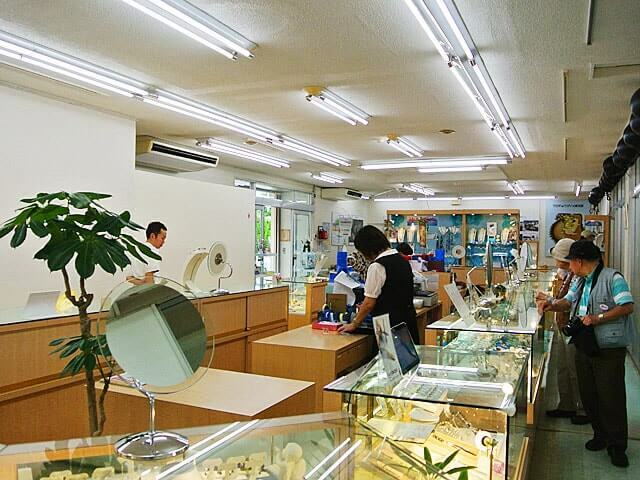 Additionally, it is one of the few locations where black pearls are cultured. The parking lot, which marks the entrance of Kabira Bay, is located slightly higher than the sea level. Upon exiting the car, this is what you first see. Clear ocean, small boats floating on beautiful water, cute shapes of neighboring islands, and the sweeping sky. This combination is the greatest feature of Kabira Bay. After taking in the scenery, walk down to the beach. The contrast between the white sandy beach and the emerald green water is breathtaking. Swimming is prohibited in Kabira Bay. The beautiful corals and schools of tropical fish may make you want to jump in the water, however, the current is fast and very dangerous. Be sure to enjoy the bay out of the water. There is a local bus from the airport to Kabira Bay. It is the bus to “Yonehara Campground (Yonehara Kyanpujo Iki),” departing at noon and 3pm. This bus will take you to Kabira Bay, without having to transfer to another line (approximately 40 minutes). It is possible to get to Kabira Bay at other times throughout the day by taking multiple buses. Take the “Airport Line (Kuko Sen)” from the airport to the bus terminal, then transfer to the “Kabira Resort Line (Kabira Rizoto Sen)” heading to Kabira area (Kabira Homen Yuki) (approximately 35 minutes from the airport to the bus terminal, and approximately 40 minutes from the bus terminal to the Kabira Bay). The “Airport Line” runs every 30 minutes, however, there are only 6“Kabira Resort Line”buses per day. Be sure to check the bus schedule ahead of time. Kabira Bay is a 40-minute drive, heading about 25km in the northeast direction, from the airport. 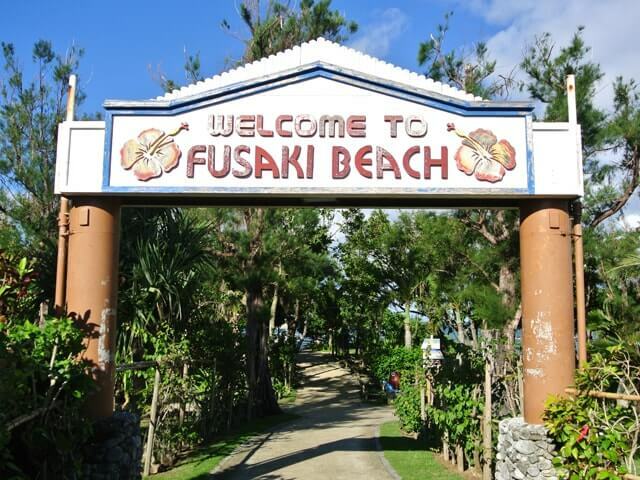 Bus is the only mode of public transportation on Ishigaki Island. 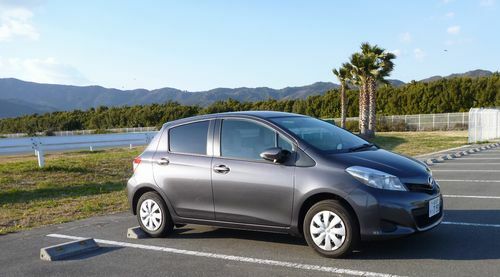 Touring the island is most convenient by car, if you are able to rent and drive a rental car. There are 2 buses to go from Ishigaki Port to Kabira Bay. Either the No. 9 line, “Kabira Resort Line” and the No. 11 line, “Yonehara Campground Line” can be used. “Kabira Resort Line” will be quicker to the Kabira Bay. 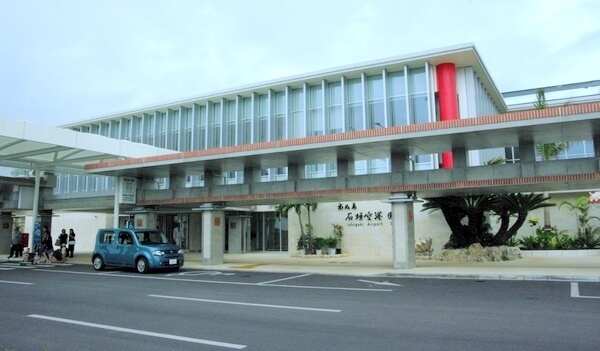 The fare from Ishigaki Port Bus Terminal to Kabira is ￥720, and there are 8 stops in between the stops. The fare from Ishigaki Port Bus Terminal to Kabira on the “Yonehara Campground Line” is ￥1,150, with 24 stops along the way. 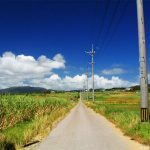 This route takes longer, and includes a stop at the Ishigaki Airport. 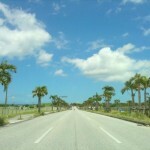 A 35-minute drive in the northwest direction from the Ishigaki Port. A simple route on a single highway. To go by car, go north on Highway 79 then, change to Highway 207. It is approximately a 20-minute drive to Kabira Bay. To go by car, take Highway 390 to Highway 209, to Highway 87, to Highway 79, and then to Highway 207. 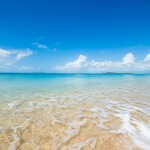 It is approximately a 40-minute drive to Kabira Bay. There is a free parking lot for 15 vehicles at the Kabira Bay. You can usually find a spot in this free lot early in the morning during the busy season (summer; at the end or the beginning of the year; long holiday times) or off-season (anytime other than the busy season). The lot will be full from noon to evening during the busy season. When the free lot is full, you can use the pay lot located on the opposite side. The fee at the pay lot is ￥300 for the day. Parking fee could be ￥400 per hour in a metropolitan area in Japan. In comparison, the fee is considerably cheaper. The parking fee is waived if you purchase a ticket for a glass-bottom boat ride. Perhaps you may be hesitant to “waste money on parking.” However, I feel that hesitating or waiting for a spot to open in the free lot is a waste of time. 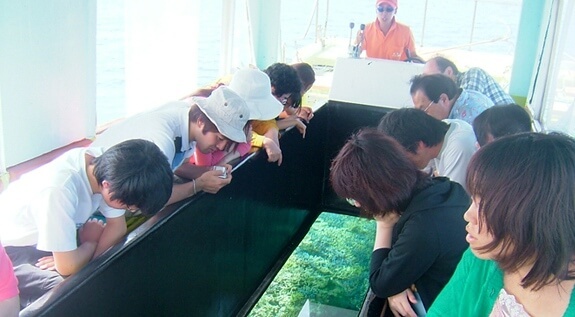 Glass-bottom boat is one of the popular tourist activities at the Kabira Bay. It is highly likely that you would want to take the ride. Therefore, it is more productive to park the car in the pay lot and spend more time actually enjoying the sights on your trip. Do no park on the street. It will be a nuisance for other tourists as well as the locals. Swimming is prohibited in the Kabira Bay. 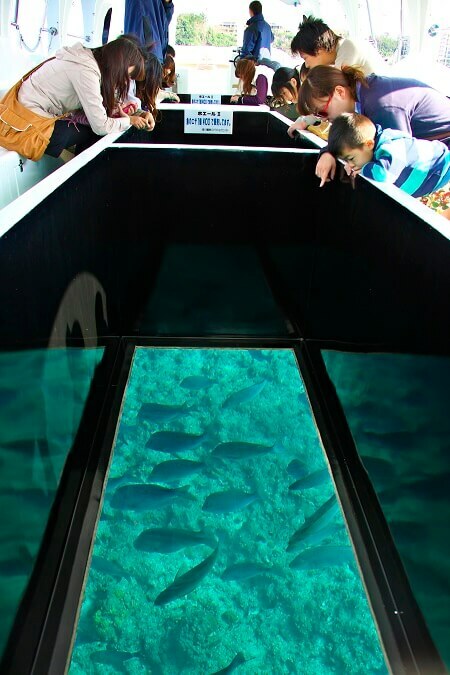 Glass-bottom boat is the only way to observe the corals and tropical fish in the water. 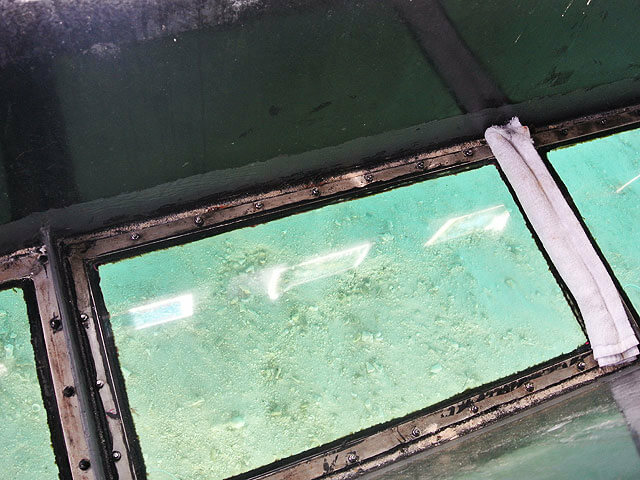 Clear “glass” panels line the central floor of boat, allowing a close-up observation of the underwater creatures. A variety of colorful corals live in the Kabira Bay, creating an amazingly beautiful underwater scenery. Kids will be excited to find clownfish in the water! 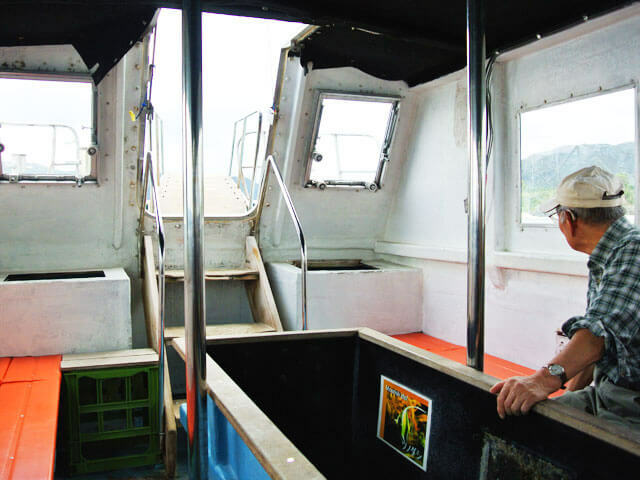 There are many companies that offer glass-bottom boat tours at the Kabira Bay. Most of them operate between 9:00am and 5:00pm. 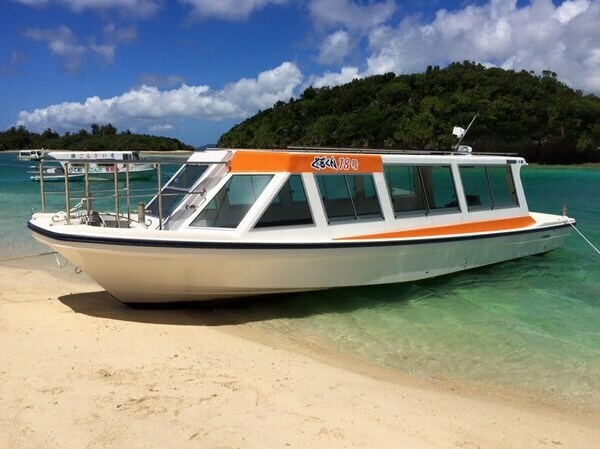 If you are interested in taking a glass-bottom boat tour, head to Kabira Bay during these hours. 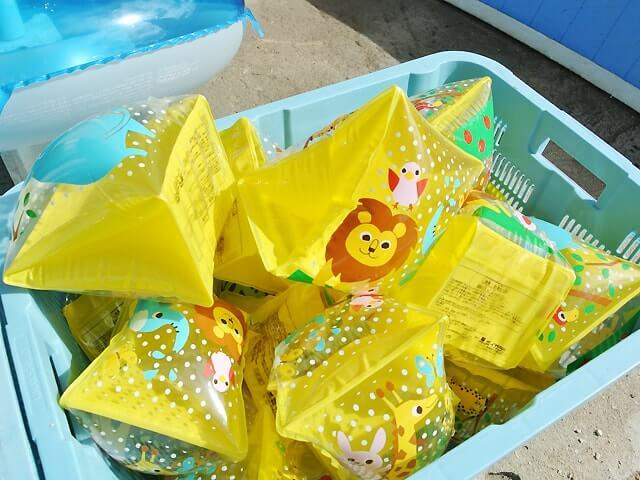 Most of them charge around ￥1,000 for adults and ￥520 for children. They operate every 15 minutes, so you will not have to wait too long. There are 9 uninhabited islands in the Kabira Bay, and there are tours that take you to explore the islands. The uninhabited islands maintain natural environment, full of plants that are native to Okinawa. 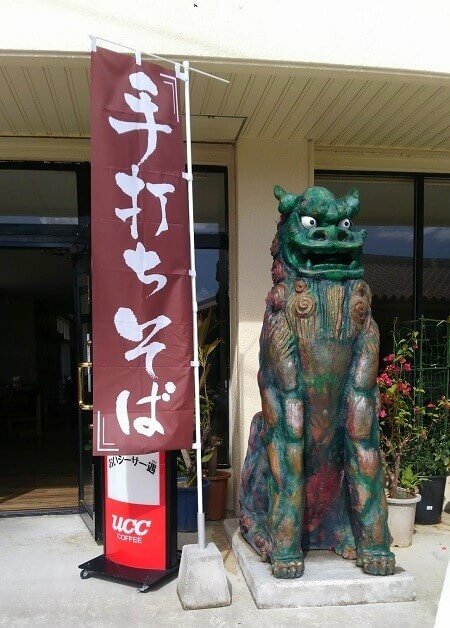 It is a uniquely Okinawan experience. Warning: the sea level changes drastically based on the tide (in the past, I nearly had my bag swept away into the ocean due to a quick change in the tide). Purchase tours to the uninhabited islands at one of the marine shops in Kabira Bay. Tours last about 3 hours. Tours cost around ￥3,500 for adults and ￥2,000 for children. There is a guided tour to kayak around the uninhabited islands, explore the islands on foot, and enjoy snorkeling around the islands. This is the only way to enter the ocean in Kabira Bay, where swimming is strictly prohibited. Kabira Bay is home to a large number of corals due to its high water quality. 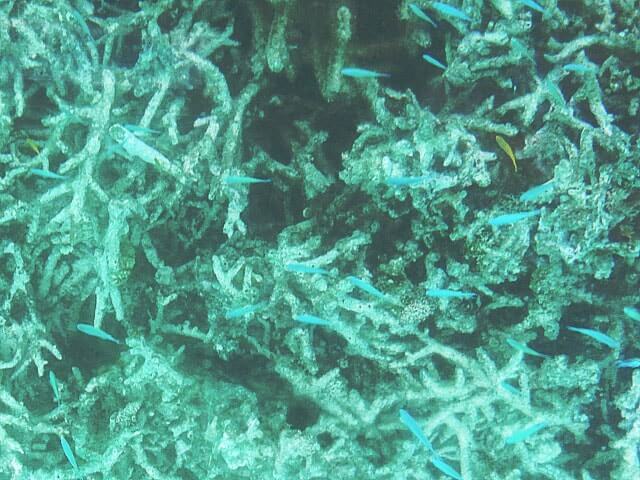 In turn, corals attract a variety of tropical fish to the bay. Seeing the underwater life with snorkels offers a completely different experience from the glass-bottom boat. Seeing Kabira Bay from a kayak is also amazing! It feels great paddling a kayak on emerald green water. Children over 6 can ride in a kayak. This is an activity for the whole family! 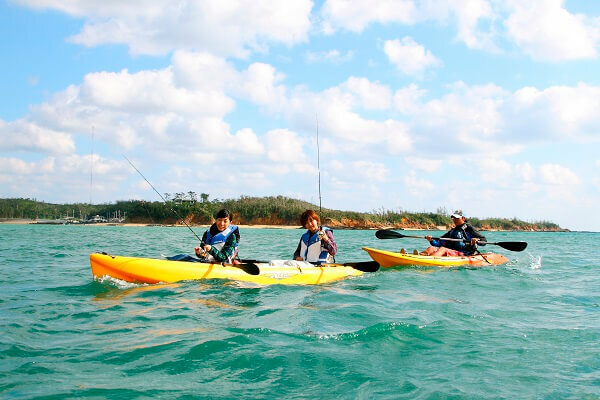 The cost for the kayak, uninhabited island exploration, and snorkeling combination tour is around ￥8,000 for adults and ￥6,000 for children. The duration of the tour is approximately 3 hours, but it is best to prepare to be away a bit longer. Set aside at least 1 whole day to spend around Kabira Bay. An eatery behind Kabira police substation with a large Seesaa in the front. Popular among the locals, it offers 4 types of homemade Okinawa soba noodles: normal; mugwort (yomogi); Pipachi (island pepper); hot pepper*. The noodles do not contain eggs, preservatives or food color. 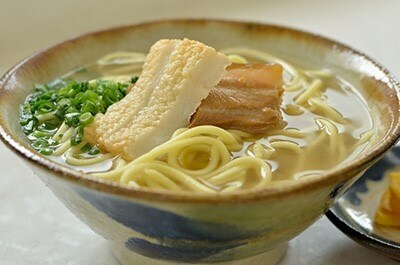 Currently, thin, round, straight noodles are popular in the Yaeyama region. 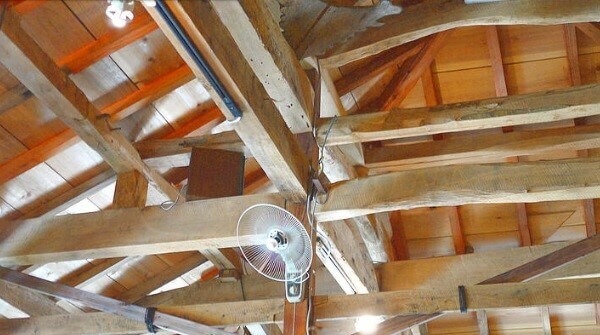 However, this restaurant still serves flat noodles, which were popular in the Yaeyama region until around 1972. Every bowl is made with care. 緑The green color of the noodles comes from the Peucedanum japonicum (Botanbofu) plant, which has been used in Okinawa for a long time. 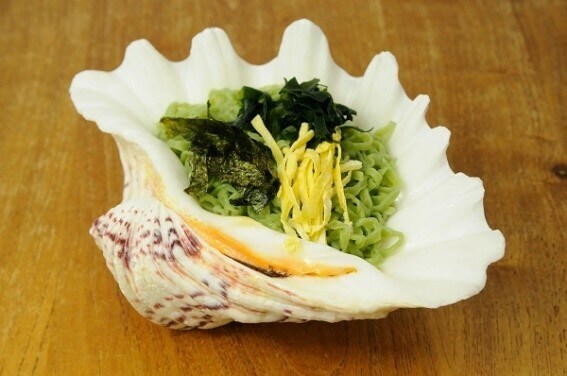 The seashell bowl accentuates the green color of the noodles. You can enjoy different seasonal flavors with the changes in season. The restaurant offers dishes other than soba, including Katsudon. 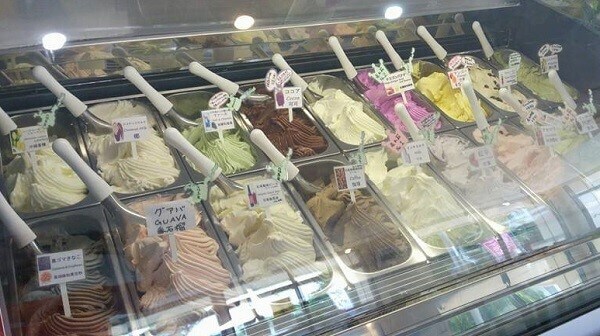 Popular for its homemade gelato as well! (Made with milk from Ishigaki Island. Soymilk gelato also available. 18 different flavors. Teppanyaki restaurant featuring Okonomiyaki. 2-minute walk from Kabira Bay. Okonomiyaki is a famous regional dish from Kansai/Osaka area. 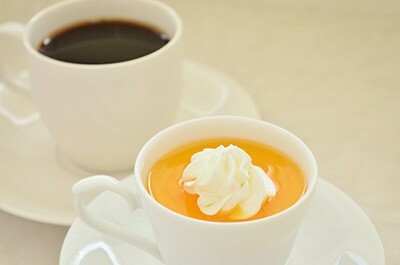 Therefore, it is not a typical item in Okinawa. 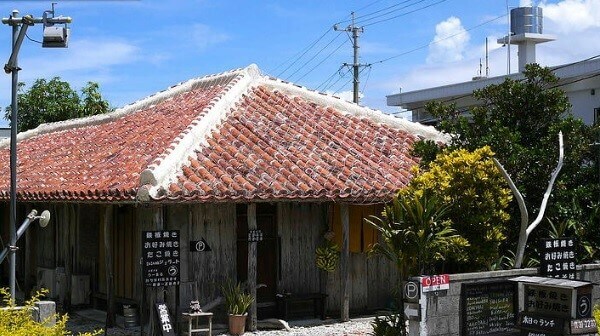 When you get to the restaurant, however, it is an old Okinawa style residential building with a red tile roof. 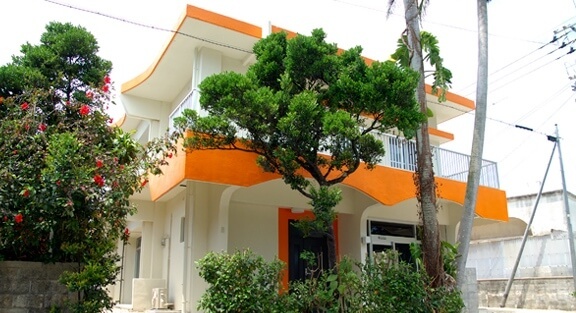 The restaurant makes very good use of the characteristics of a residential building, allowing its patrons to enjoy a very unique Okinawan atmosphere. Ishigaki Island flavors are incorporated in the menu. Okonomiyaki with island tofu, hamburg steak with Ishigaki beef, etc… Non-Okinawan dishes are uniquely arranged with products from Okinawa. 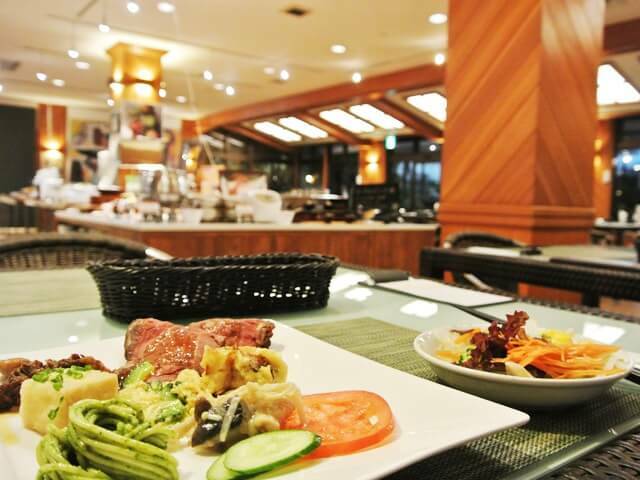 The restaurant also offers Okinawa cuisine, such as Chanpuru. All of their dishes use local ingredients from Ishigaki Island. In particular, Okonomiyaki with island tofu is popular for the fluffy texture and deliciousness! Be sure to give it a try. Another recommendation is the island Wagyu sirloin steak plate. Teppan-grilled Ishigaki beef is tender. Great for the beef-lovers, but also its mild flavors are suitable for those who normally do not eat beef. Takes take-out orders by phone. The café located inside the “Ryukyu Shinju Kabira Honten,”a 3-minute walk from the Kabira Park Observation Tower (Kabira Koen Tenbodai). The café overlooks the bay, thus it is perfect for enjoying the clear ocean indoors. Alternatively, take a seat on the wooden deck terrace to enjoy a meal with the ocean breeze. Add some Pipachi (island pepper) and Koregusu (Awamori marinated island peppers) to customize your Yaeyama soba. Taco rice features salsa, spicy ground beef, crisp lettuce, fresh tomatoes, and cheese over rice. The flavor combination is addictive. Recommended dessert is the homemade rare cheesecake. The rich cheesecake is covered with the passion fruit syrup. 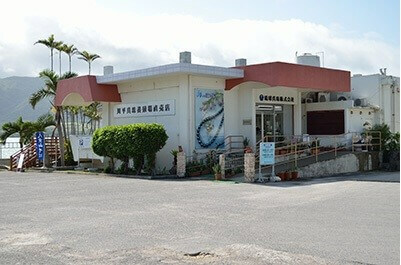 Ryukyu Shinju Kabira Honten is the direct retailer for the world’s first culturing facility for black-lip oyster pearls. As such, the store has a great selection of both black and silver-lipped oyster pearl jewelry pieces. 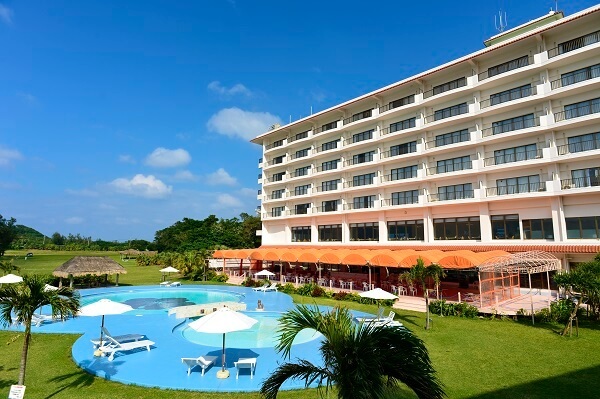 A hotel in the major Yaeyama beach area. 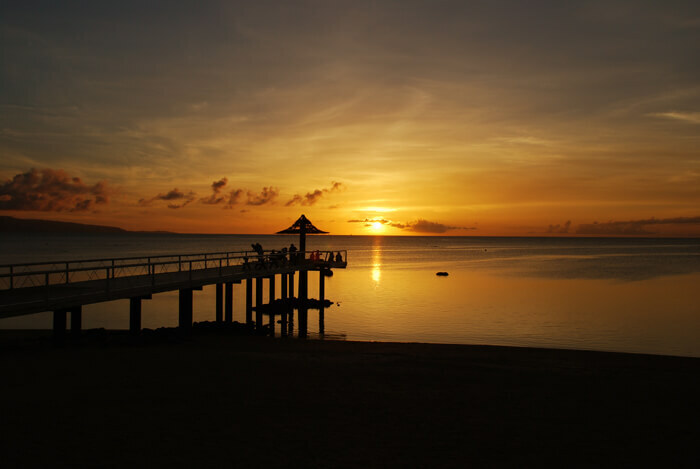 It is a 5-minute drive from Kabira Bay, perfectly located for visiting the bay. A room can be selected from a high-rise tower or cottages. The beach adjacent to the hotel is very clear. The ocean is beautifully bright. This hotel is particularly suitable for those looking to enjoy the view of the ocean from the hotel room. The view of the beach from the top floors is simply stunning. The hotel offers a great selection of ocean activities. Cottage style accommodations in “Kabira Village” is perfect for those looking to stay in a relaxed atmosphere. It is a bit pricey, but you will spend a luxurious time. Next is “Yado Marine House,”located about 10 seconds away from Kabira Bay on foot. It is a 10-second walk from the Kabira Bay. Twin room is ￥3,500 per person per night. While it is extremely reasonably priced, it is clean and may be liked by female travelers. The hotel offers a common microwave and a coin laundry facility, making it attractive for a long-term stay. 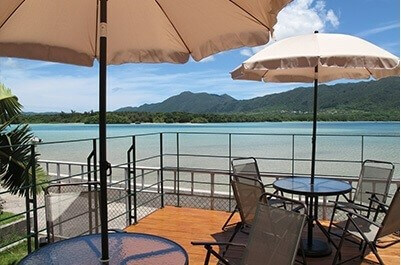 Located slightly away from the Kabira Bay, this is a resort hotel featuring cottage style accommodations. Buses to Kabira Bay stop right in front of the hotel (Kabira Resort Line), making it a convenient base for visiting Kabira Bay. The hotel has access to a natural beach, however, none of the rooms have the ocean view. Therefore, this hotel is not for those hoping to see the ocean from their hotel room. On the other hand, the hotel scores points for large rooms, beautiful facility, and great food. 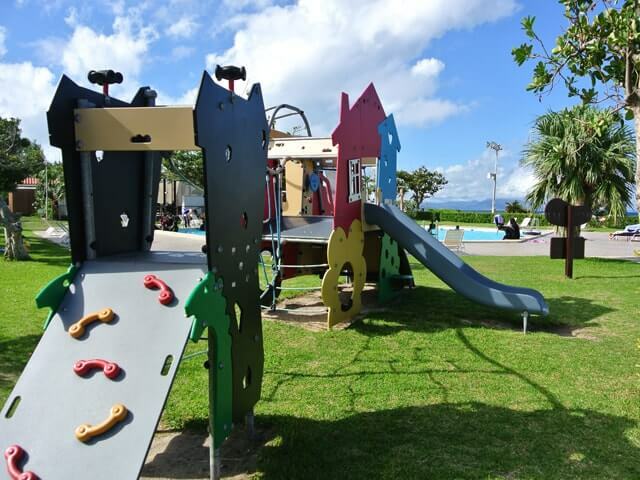 In addition, hotel offers great amenities for families with small children, including children’s menu at dinner buffet, pool toys and children’s pool facility, and a limited number of rooms stocked with children’s items. 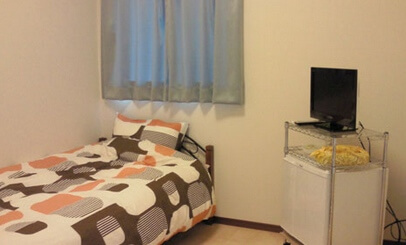 The cottage style room may seem to more closely resemble the life on Ishigaki Island, rather than a standard hotel room. 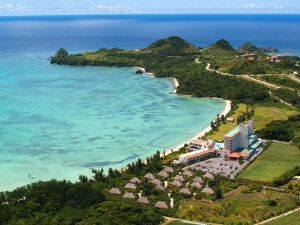 The area surrounding the hotel is full of nature , allowing the visitors to slow down and enjoy the Ishigaki Island time. ・How long should I stay? Depends on what you want to do/see. 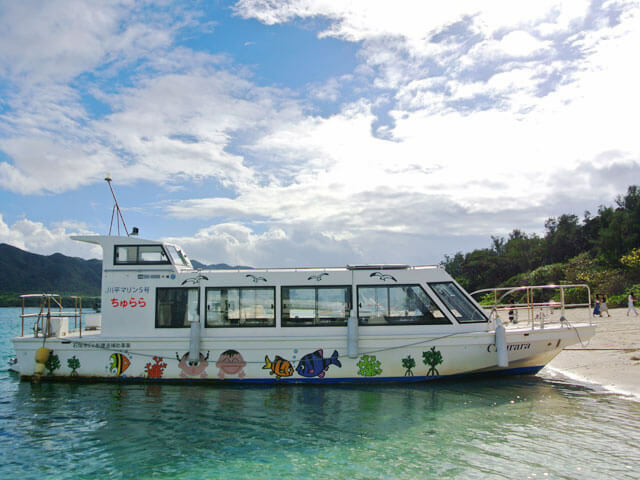 1-2 hours is sufficient if you just want to “ride the glass-bottom boat and enjoy the scenery a bit.” If you are interested in kayaking, the uninhabited island tours, snorkeling, or other activities, you would need at least 4 hours. ・Do the roads get congested? Depends on the season. You are most likely to see road congestions during the Golden Week (in most years, April 29th ~ May 5th) and summer break (later July~August). Ishigaki Island is not a large island. Kabira Bay is its most popular sightseeing spot, therefore naturally, you will see some congestion. Furthermore, the road to Kabira Bay is a 2-lane road. As a result, you will some road congestions. You can avoid congestion by traveling during the off-season. ・Is it possible to visit in rain or typhoon weather? It would be difficult to fully appreciate the beauty of Kabira Bay. On a rainy day, the water will be cloudy, and the sunlight will not penetrate to the sea floor, so you will not see its emerald green water. Moreover, since the seawater will still be cloudy the day after the rain, the glass-bottom boats will not be operatig. The glass-bottom boats will not operate during typhoon. It is possible to look at the Kabira Bay from an overlook… It is not possible to see the emerald green ocean unless it is a bright sunny day. It is best to allow some flexibility in your trip schedule to accommodate bad weather, if possible. 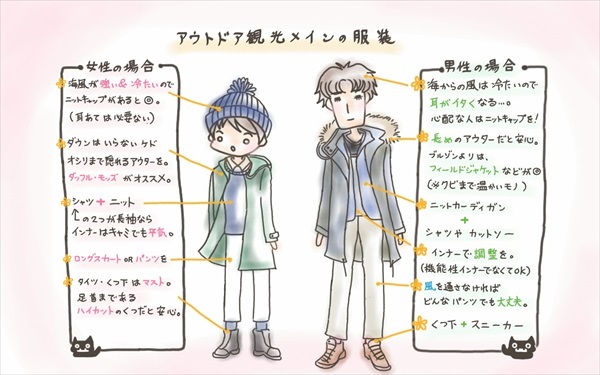 ・What to wear in winter? 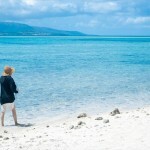 The best attire for Ishigaki Island winter is a sweater, a hoodie, or a light jacket. Despite its image as a “warm tropical island,” it still gets cool during in winter. The temperature will rise to 25 degrees Celsius on a sunny day in winter. However, it will be chilly if it rains or is windy. Layer a long sleeve over a short sleeve shirt, so you can easily take the outer layer on and off as needed. ・Planning to sightsee in the afternoon. How late is OK? The stores around the Kabira Bay will start to close around 5pm. 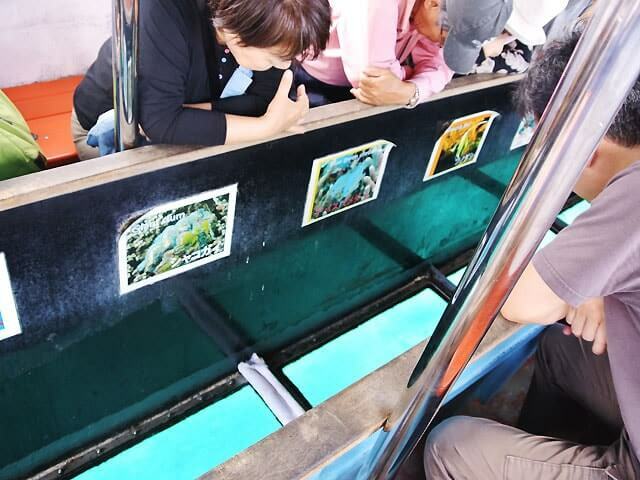 The glass-bottom boat tours will also end at 5pm. Therefore, 5pm is probably the latest for sightseeing activities. You can enjoy the scenery even past 5pm, until sunset. Still, the best time to visit is during the day. The water will lose its beautiful color as the sun goes down. 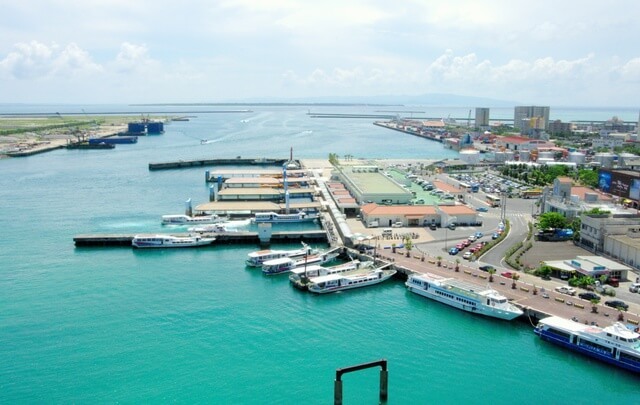 It is strongly recommended that you see the bay at its most beautiful time during the day! How was it? Please go see Kabira Bay: simple, clear, and full of life. Best Five Breathtaking-view Oceans and Ocean-view Cafes!